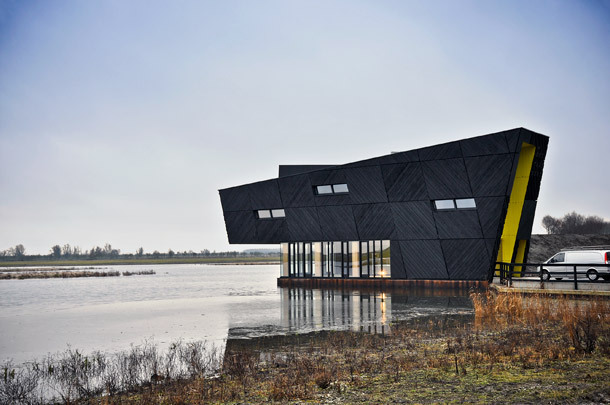 This nature centre stands on the edge of the Oostvaardersplassen nature reserve at a place where land, water, woods and reed-beds converge. From the entrance side it resembles a beacon on the dyke, yet it is horizontal and camouflaged when viewed from the reserve. Consisting almost entirely of wood, the Nature Centre contains an information centre, a restaurant, a teaching area and a platform for birdwatchers. Prefabricated timber panels of glued diagonal strips kept construction time to a minimum so as to disturb the surrounding nature as little as possible. There is no link-up with the sewerage system; sand and reeds take up and filter the wastewater.